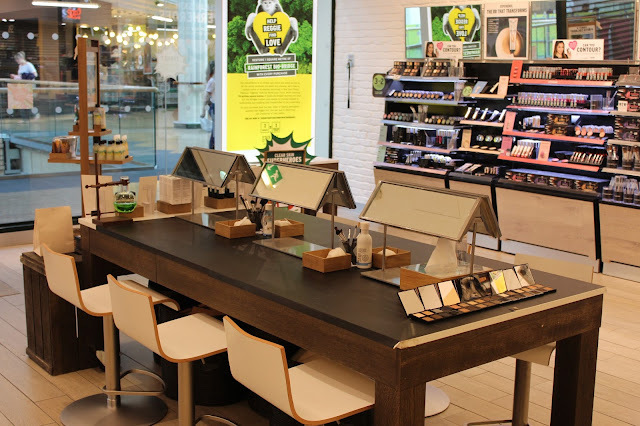 Last weekend I had the pleasure of helping to pull together an event at The Body Shop High Street store in Meadowhall, Sheffield. With my experience of events and links to local bloggers we were able to pull off a really interactive event which I thoroughly enjoyed! The focus of the event was primarily around the new luxury face mask range The Body Shop launched earlier this week but we also got to have a play with some of the other products and we were even treated to a mini pamper session. The Body Shop's new range of luxurious face masks are a rather delicious addition to their huge product range, each mask smelling completely different and retailing at high street prices. 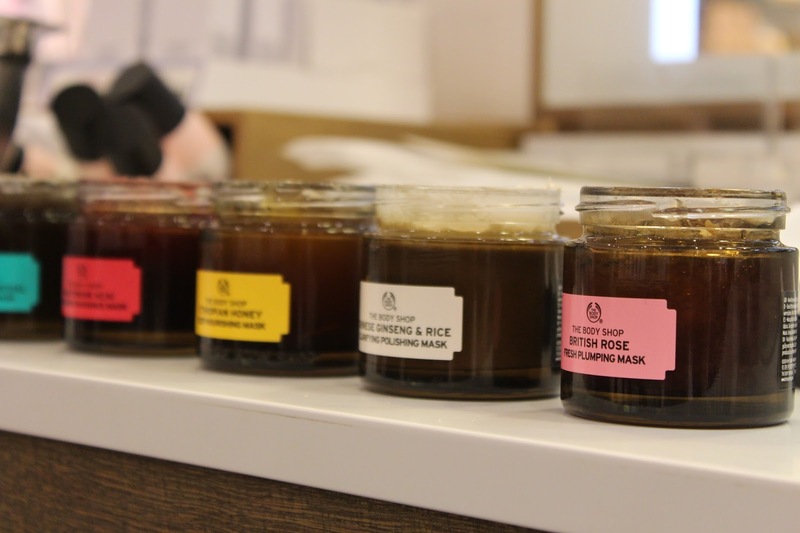 The Bodyshop ladies really went to town on their masking station at the event; they set up a beauty bed for bloggers to relax on whilst they each had a face mask applied. Amazonian Acai- An energising mask to help brighten up dull and dry skin. This mask contains Acai berry, Guarana seed extract to exfoliate and Fair Trade organic babbassu oil. 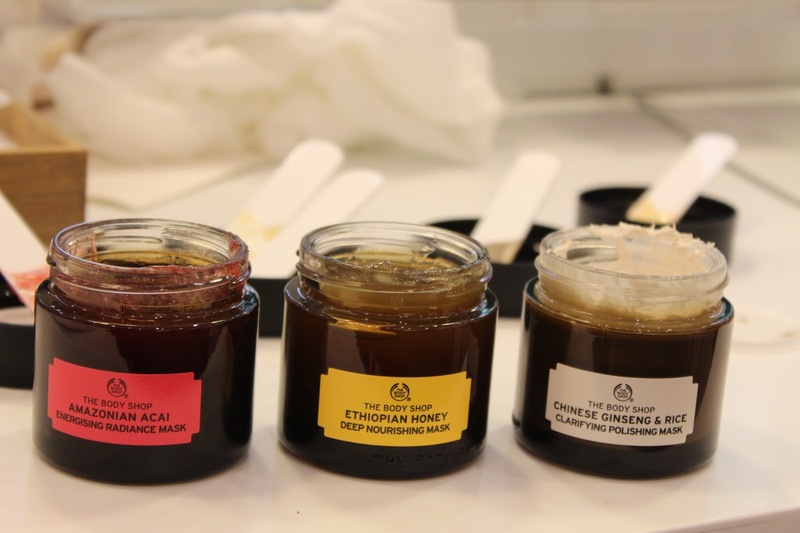 Ethiopian Honey- A nourishing facial mask for dry skin or skin showing the signs of ageing. This mask contains Fair Trade everything- honey, marula oil and organic olive oil. British Rose- A plumping facial mask for normal to dry skin. This mask contains real rose petals, rose-hip oil and Fair Trade organic aloe vera. Himalayan Charcoal- A purifying detox mask for oily and blemished skin. This mask contains bamboo charcoal, Fair Trade organic tea tree oil and green tea leaves to help exfoliate the skin. 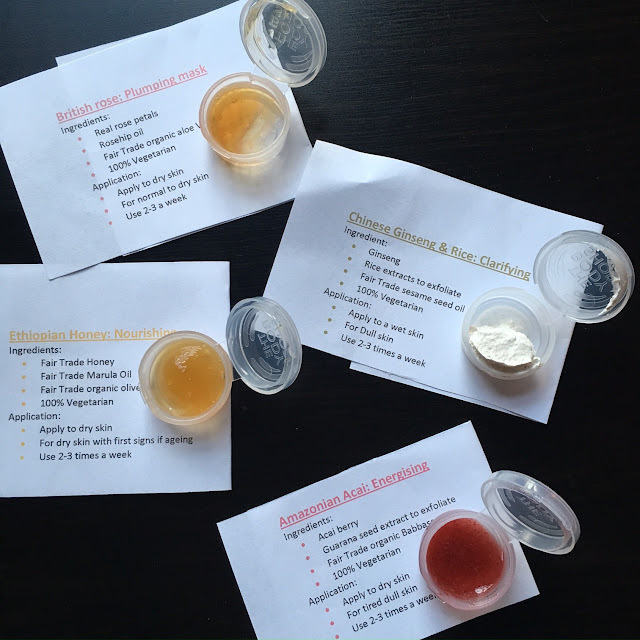 Chinese Ginseng & Rice- A clarifying mask to help brighten dull skin and repair unevenness. This mask contains Ginseng, sesame seed oil and rice extracts to exfoliate the skin. All of the masks are 100% vegetarian, luxuriously thick on application and cost £15 each for a 75ml pot. 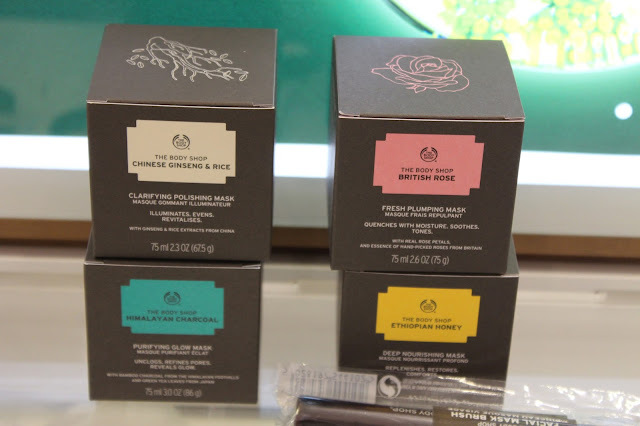 Along with the mask pots The Body Shop ladies also showcased the new mask application brush; this is something I would recommend as it adds that feeling of luxury when applying the masks and means you don't waste product by spreading it all over your hands too. Each of the masks can be used around 2-3 times a week.. although I'd probably save it for sunday pamper nights. 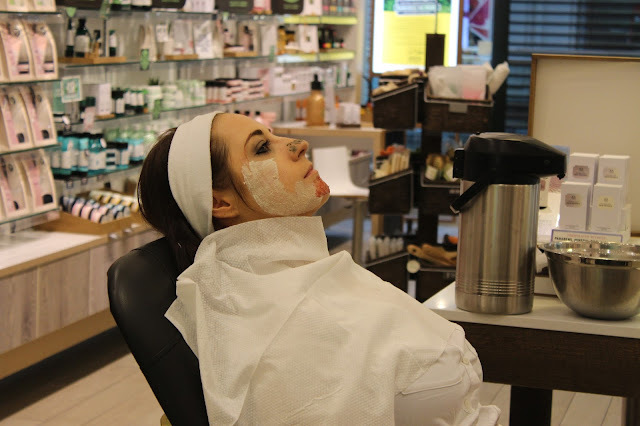 The lovely Carolanne from A literary Cocktail getting her face masks applied.. she's got the Chinese Ginseng on her cheeks, Amazonian Acai on her chin and then Himalayan Charcoal on her nose. During the event I didn't get a chance to have a face mask applied but we were each given some sample pots of the masks to take home and try out- so far I've tried out the Chinese Ginseng mask and the British rose; my fave so far is the ginseng mask; it left my skin feeling throughly soft and fresh. The Body Shop ladies set up a foot spa station for the event too- I'm sure if you've read my pregnancy updates (most recent ones are here, here and here) you'll be aware that my feet are, at times, the size of elephants due to pregnancy swelling so the foot spa section was a pregnancy dream come true for me!! Although the swelling on my feet didn't go down it was some what a luxury to have my feet feeling pampered and soft.. I haven't been able to reach them for a long time! At the beginning of the event I asked each of the bloggers which eye look they wanted to learn how to create; cut crease, smokey or natural. 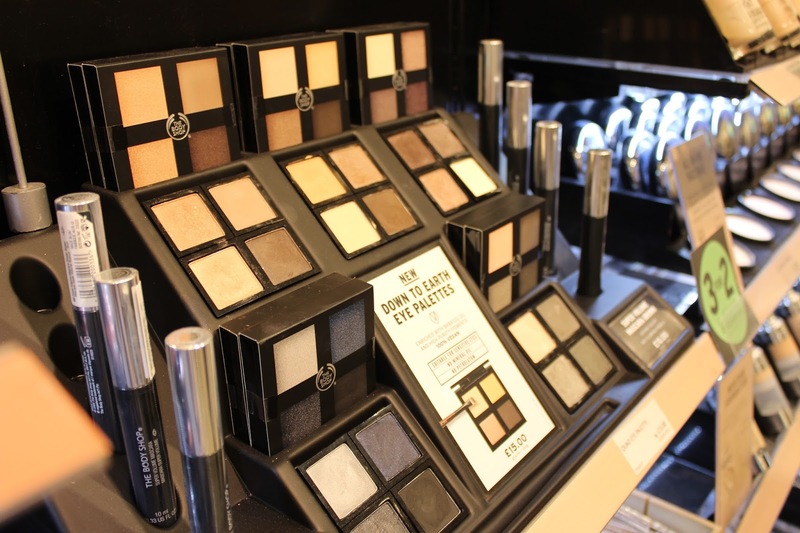 During the evening The Body Shop babes ran tutorials on how to create these looks using the new Down To Earth shadows. 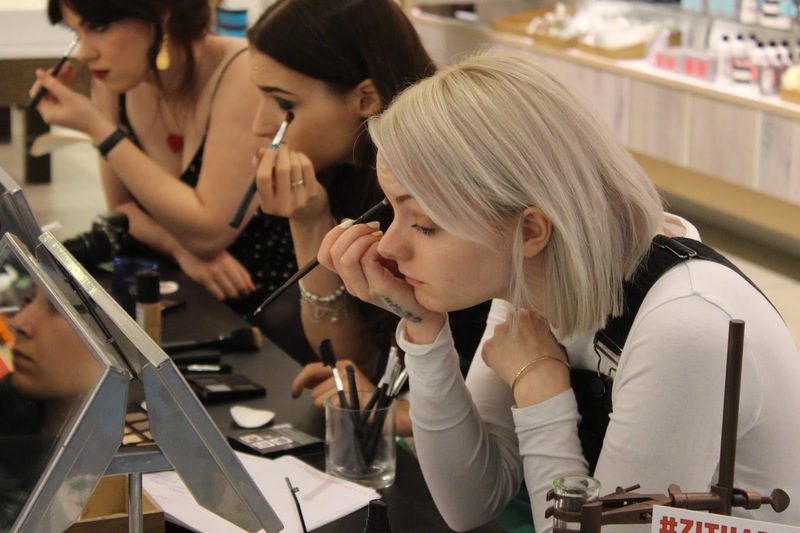 Bev from Bevebeee blog and Becki from Prime and Dine both having a master class on the smokey eye look using the Down To Earth Shadow Glow Palette. I tried my hand at the cut crease look using the Smoky Gold Palette and the new double ended eyeshadow brush. 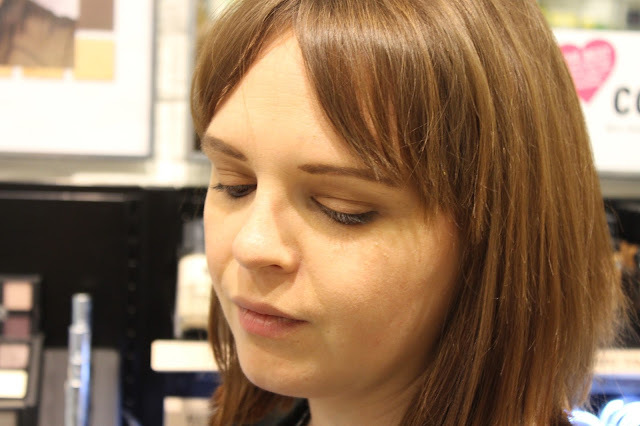 I was quite happy with the finished effect- I never really had the knowledge when it comes to shadow looks so it was great to get some expert tips from The Body Shop ladies. I found the new eyeshadow brush really easy to use and something that I plan on buying next time I visit the store. Although I didn't purchase the palette this time, the skills I picked up from the master class have meant that I've used some products I already have gathering dust in my makeup collection... once I've finished them I'm going to treat myself to an item from the Down To Earth range. For helping out to plan the event and getting the bloggers together The Body Shop ladies kindly gifted me a very generous hamper of lovely products to try out. 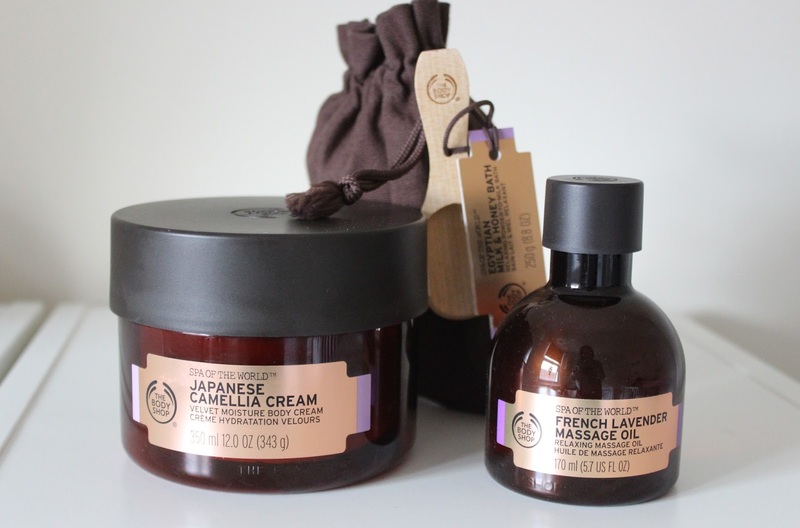 I'm yet to try out all of the products yet but I am already loving the Japanese Camellia cream- I've been slathering this on after having a shower and..ohhh it smells divine- also this came strongly recommended by Leanne from LEM Blog. Have you tried out any of the Expert Face Masks yet?